Standard & Poor's has lifted Greece's credit rating from 'selective default' to 'B-minus', offering the troubled nation a breath of fresh air and aiding the euro. At the same time, there seems to have been some progress made over the next US budget and this brought additional buyers into the shared currency. Consequently, the euro/dollar pair climbed to its highest level for seven months, posting a 60 point gain to $1.3221. Today sees UK inflation data out this morning, which is expected to fall following last month's jump on the back of the rise in tuition fees. It will be interesting to see the individual food, utility and petrol components, but the overall year-on-year number is due to decline from 2.7% to 2.6%, with month-on-month falling from 0.5% to 0.2%. Eurozone exports posted a second consecutive decline in October amid growing labour costs and an economy which officially contracted for two consecutive quarters. With little signs of improvement in the near future, the European Central Bank downgraded the economic outlook for this year and the next. That put pressure on the euro, which finished the day 23 points down at $1.3161, and it remains at these levels this morning. Near-term support and resistance for the EUR/USD forex spread betting pair is seen at $1.3140/25/10 and $1.3185/1.3210/55 respectively. On the currency front, sterling and the euro remain wedged in their annual ranges, although recently they have both been tending towards the higher end versus the dollar. The dollar is suffering slightly over the prospects for the next few weeks, with the need for the Democrats and Republicans to agree a realistic budget. There may be some concerns over the 'fiscal cliff', but most people realistically acknowledge that some whitewash will be agreed. It seems likely that a new law will be passed to push the cliff a bit further away, but eventually we will almost certainly see a heavily watered down version of the cliff anyway. The euro bulls have control for the moment, but the currency has not yet broken new ground. The euro closed fairly flat at $1.3076 yesterday, as Eurozone finance ministers approved the release of €49 billion to Greece and reiterated their ongoing support should the country get into further troubles. After dropping below the $1.29 mark, the shared currency is once again trying to convincingly cross above the $1.31 level, where it has failed a few times over the last 3 months or so. This morning, investors are supporting the single currency, sending the euro-dollar pair back above $1.31 to $1.3110. After breaking back above the $1.3000 mark, the euro continued to rally on the back of the new set of easing measures announced in the US. At the same time, there seems to be a complacency developing among EU officials who are happy to wait for the German elections before agreeing anything serious. So, more on a relative basis, the euro gained 61 points to $1.3063. This morning, the EUR/USD spread betting market is sitting at $1.3080. Yesterday's German ZEW survey pointed to a climb in investor confidence thus attracting demand for the common currency. At the same time, there has been growing anticipation that the Fed is poised to further ease its monetary policy. This has fuelled a risk-on approach in the last few sessions. The result was that the euro saw another gain versus the dollar, up 60 points to $1.3003. This morning it is just about clinging onto the $1.3000 level at $1.3010. In yesterday's forex spread betting, the shared currency initially edged lower as Italian Prime Minister Mario Monti announced his plan to resign after losing support in Parliament. Nonetheless, speculation that the Federal Reserve will boost its monetary stimulus during today's meeting turned the table against the dollar. 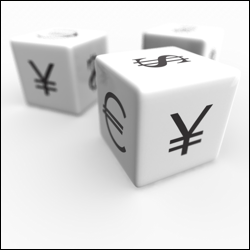 Consequently, the EUR/USD pair finished the session 50 points up at $1.2941 and remains around that level this morning. FX markets continue to mark time with the euro still stuck in the, roughly, $1.26 to $1.32 range. The power of the German economy seems to outweigh the combined effect of the rest of the Eurozone leaving us oscillating around current levels. Resistance can be seen at $1.31 and support at $1.2825/35. Sterling has been stuck between $1.50 and $1.65 for several years now and with the current price at $1.6033-35 there is not a great prospect of this changing much in the medium term. The oscillations have been getting smaller and smaller since the gyrations of 2008/09 and volatility is now at a multi-year low.